The heart of the home is also the home in miniature, a multi-purpose room that is all things to all family members, as much a repository of secret, fleeting hopes as of the good things that emerge from cupboards and oven doors. That combination of shared laughter and mouthwatering diversions makes every kitchen an Aladdin’s Cave. Like soft rock, it bears the impress of daily life, its tabletops scored by a variety of hands, walls busy with children’s artwork, noticeboards bristling with new and spent invitations. It’s a place for physical and metaphorical nourishment, and is happy-warm with the heartbeat of a shining range oven and the breath of sleeping dogs. It is a large room, which includes at least one armchair and, ideally, a sofa. Its table seats upwards of eight and is more often used for entertaining than the dining table. The kitchen enjoys views on at least two sides and a door to the exterior. First fingers of natural light add cheer to winter breakfasts; after dark, electric lighting targets food-preparation areas. The room’s multi-tasking is reflected in a hybrid decorative idiom that combines workman-like austerity-simple, housekeeper’s-cupboard-style painted joinery-with something rather more grand: updated dining-room style in the form of smartly covered chairs, paintings on the wall and, at the centre of the long, modern table, a glamorous Minton tazza-the last-remaining piece from a dessert service made for the Great Exhibition. The perfect kitchen lends itself to assertive Modernism or a retreat into the past, its surfaces made from poured concrete and coloured Corian or reclaimed French fruitwood and scrubbed pine. The floor is stone-flagged, with underfloor heating in the absence of an Aga. Windows have blinds as often as curtains. There must be a clock, large, circular and wall-mounted. Let there be everything here that suggests time shared happily, with an instinct for indulgence: cupboard doors that open with a sigh of cinnamon and cloves, a fruit bowl artlessly heaped, baskets of this year’s walnuts. Adjoining the kitchen is a butler’s pantry stocked with china and glass. Here, the dresser is partly decorative, its shelves rainbow bright with old Majolica and Sunderland lustre, spongeware, ironstone breakfast cups and vintage Coronation mugs. Careful planning underlies the siting of oven, sink, food-preparation areas and washing-up machine. All lie comfortably within reach of one another. 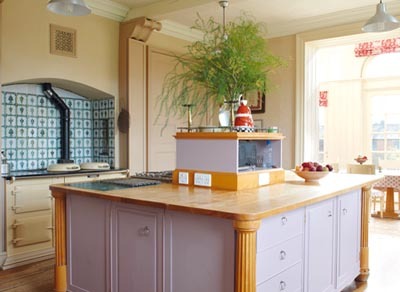 Perhaps an island or a sofa with an upright back provides a partial screen between the busy cook and his or her guests. Possibly, the cook-host distracts their attention with a glass of something delicious taken from the wine racks, which, as in trendy restaurants the world over, are a feature of the decoration. Food for the most part is stored outside the kitchen in a further pantry or larder. There may be a bookcase; a carved Jacobean trunk stacked with children’s toys and games; a chest of drawers for utility bills; an antique square piano which, long deprived of its keyboard, has been reinvented as an elegant serving table. In round pots grow aromatic clouds of basil, coriander and oregano; there are goldfish in a tank or, come the spring, a slick of opaque frogspawn. Year-round, as trusty as an old dog, stands the radio. Zinc-topped or covered in oilcloth, the kitchen table will draw family members and visitors alike. Here, raffle tickets for the church appeal come to rest beside a scurf of pens, the newspaper television supple-ment and a china footbath planted with scented pelargoniums. Its magnet-like status arises through consensus-and when parents yearn to listen to the radio undisturbed beside the Aga, they learn to quash what is, after all, a foolish notion.